Rate pot doesn’t work, but tap tempo does (altho it seems to be in a perpetual 2:1 multiplier mode against whatever I tap in. Depth pot doesn’t work, and causes the tap LED to light up solid at its lowest setting. Spacing and Harmonic Mix seem to work. The Tap LED is off when the unit powers up, reflects tempo when using the tap tempo, but goes solid when messing with any of the other controls on VR1-VR6. The pots are not touching the PCB. Edited: removed a bit about a short I thought was present using my meter, but I was mistaken! 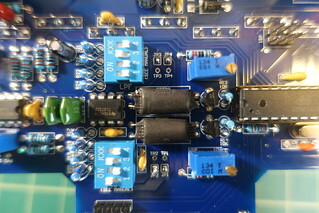 The VR1-VR6 voltage dividers / analog inputs read 0 to 5V independently based on pot position. Continuity across U1 ground, PCB ground, pot ground lugs, etc. Is there a way I can check if U1 is functioning properly? I’m sorry you are having trouble with your Quaverato. That sounds like an unusual issue. If you hold down the tap switch for 3-5 seconds as you power the pedal on the green led will start blinking a pattern of numbers associated with the software version. It should blink 2 times then take a break, then blink some more times,take a break, and then blink some more times…take a long break and repeat this sequence. If you can get the pedal to show you a software number this way then the microcontroller should be working properly. Let me know how many times it blinks in each interval…if you can get it to work. If you can’t get it to work you still may have a good micro, but there may be a short or open in the circuit somewhere causing this problem. One thing that seems like it could cause this type of problem is if the clock source isn’t stable. 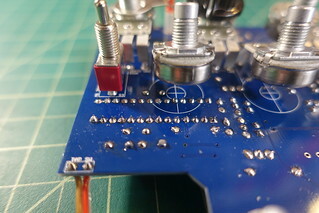 Please check the solder joints on Y1 and C5 and C6 to make sure those timing components are connected properly. Thanks so much for the detailed response! Getting tap LED flash sequence 2-3-6 when performing the start-up hold above. This matches up w/ the slip of paper that came w/ the unit, s/w ver 2.3.6. Good to go I guess. I checked Y1, C5, and C6 first. Continuity or open where it’s supposed to be against the schematic (Y1 should read open when unit is powered off I assume). Replaced C5 and C6 just in case and remeasured everything. Checked each pot again, checked voltage across wiper to ground at various positions of the pot’s sweep, verified getting the same voltage reading at their respective pins on the microcontroller (verified at the actual pin on the chip, not just the solder point of IC socket/PCB). Went back and checked correct component placement again. 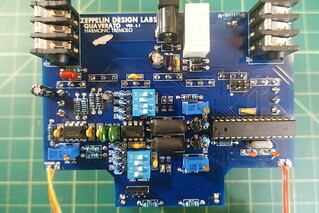 Power unit up, bypass LED off, tap LED on solid, effect is off, clean sound thru amp. I would assume the tap LEP should be blinking at the rate corresponding to the position of the Rate pot at this point. Click bypass switch, bypass LED turns on, tap LED still solid, unit still passes clean sound. Move the rate pot around a little, tap LED shuts off, unit no longer passes sound. Click Tap switch a couple of times, unit starts passing trem-ed sound and Tap LED shows tapped tempo. Move Depth pot around, jittery trem-ed pulsed not in time w/ tempo, unit returns to correct trem-ed pulses while not moving Depth pot around. Move Multiplier pot around, tempo jumps to 4:1, stays there until I tap a new tempo in, which is now pulsing at 2:1 ratio regardless of Multiplier pot position. Moving Shape pot around does the same as moving Depth around. 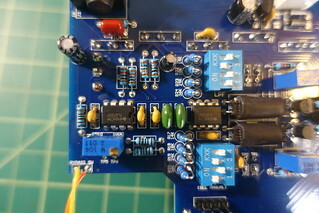 Harmonic mix works fine but does cause some jittery pulses during pot sweep. I have to this there is something wrong w/ 5V voltage divider network forming the inputs for VR1 thru VR6, but they measure fine w/ my meter and I’m not sure how the tap tempo would work and/or be affected by this anyways. Will probably start pulling pots off and replacing w/ 100k resistors to max/min out certain parameters one at a time to see if I have a weird pot or something that’s causing voltage spikes or something. Or replace Y1. Or buy a pre-made unit and give up on this one! It seems like I have seen something like this before. The eeprom in your micro controller could have somehow been set to random values (it could have been zapped with static electricity or something to cause this). 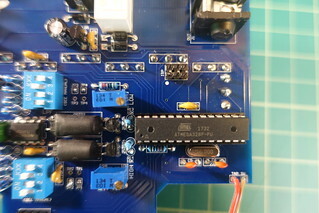 The eeprom is used to set some values upon startup and it’s also where the presets are stored. If there are random values in these registers then it could cause an issue (somewhat) like this. If this is your problem then you need to fill all 6 presets with valid information that the pedal can understand. First of all twist all the knobs full clockwise and then fully counterclockwise…this should get the micro controller to register all the functions. To save the first preset, set the multiplier knob to 1:2. Hold the bypass footswitch down for around 5 seconds until the bypass LED starts blinking really fast. Release the switch. The pedals current setting was just saved in preset 1. 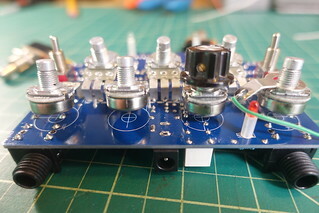 Set the multiplier knob to 1:1 (for preset 2) and hold the bypass switch down for 5 seconds until the led starts blinking, release it. Set the multiplier knob to 1.5:1 do the same thing…do this for all 6 positions of the multiplier knob. You can about the details of saving presets in our mini mod manual. Let me know if this helps or changes anything at all. Ok cool, definitely stoked to try this out when I get home tonight! Not being familiar with the way the Quav utilizes the ATMega micro (I have messed around w/ Arduino before tho), I’m running out of other hardware to check and recheck. Thanks again for such a detailed response Brach! I read thru the MIDI-mod manual. So when (re)setting the presets, you’re basically setting each preset to whatever the pots are set to when performing each preset write? We just need to have real/valid values in the registers? Are these presets used for anything if not running the MIDI mod? When sweeping all pots full clockwise, then counter-clockwise, the the micro looking for anything particular under these conditions or doing anything w/ that information? i.e. IF [all VR inputs 0V] do this, IF [all pots 5V] do that). Performed the preset re-write per the MIDI manual. At positions corresponding with presets 1, 3, 4, and 6, I get rapid flashing followed by 6 blinks, which according to the MIDI manual, correspond to preset #6. Positions corresponding with presets 2 and 5 I get rapid flashing followed by no blinks at all. Double checked that the voltage reading at the input to the micro was 0, 1V, 2V, 3V, 4V, and 5V at each position of the multiplier pot. Don’t know why 4 out of 6 positions wrote to preset 6 while the other 2 apparently didn’t write at all. Any way I can order just a replacement microcontroller? Just as an experiment take the micro out of the socket and re-seat it to make sure it’s getting good connection on all the pins. Is the Aref (analog reference) voltage on pin 21 a stable 5V? Is it still exhibiting the same symptoms since you messed with the presets? If so, does moving each of the pots and switches (all of them) cause the pedal to behave normally?…as in the pedal snaps back to reality? From my experience when the eeprom has random values in it this pot movement causes the pedal to behave normally again….but powering it off and then on starts the weirdness again. This is why I had you sweep the pots. Yes, you can re-order just the micro, but i’m not entirely convinced that that is the problem yet. Removed and re-seated the micro — same symptoms. Aref is 4.9V, seems stable. Same 4.9 at U4. Same symptoms as when I was messing with the presets, altho I wasn’t able to reset all 6 presets (mentioned previously where all position of pot resulted in preset 6 writing or no preset writing). Sweeping the pots doesn’t change anything. This is very perplexing. Your pedal must not have the problem that i thought it might have with the eeprom. I suppose we can try a different micro…although all signs are indicating that you have a good micro controller. If you end up getting a new one i’ll throw in a new crystal to try out too. Speaking of that, are you sure the 22pF clock filter caps are in the correct place, and not 100nF caps? Are you sure there is nothing shorting anything on the board…like the back of the pots or anything? Something like that would make the most since to me. Sorry for the frustration. We’ll figure this out one way or another. Here are the pics (with paper removed / pots slightly bent back to reveal board underneath). Still looking into this. 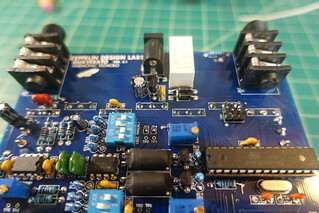 Is there a way to troubleshoot Y1 other than visual inspection of the solder joints and verification of C5/C6 values? I’m so sorry…I don’t know how i missed that you posted those photos. That gives me a good visual of your board. I’m curious if the board behaves in the same weird way when it’s out of the chassis, and the pots are pulled up a bit (away from the board) as in the photos. I want to see if something might be making a short to the board, like the pots or the chassis. It seems like some of the leads under the pots are long enough to potentially poke through the paper. Let me know about that. It’s not easy to test the crystal with out an oscilloscope, but if the green led is blinking consistently then it should be working alright. Yes, the board behaves the same way whether it’s mounted in the chassis or the way it’s shown in pictures. Definitely no shorts between the pot cases and the board below. VR1-6 voltage divider network as analog inputs to micro check out okay, measuring 0 to 5V input to micro itself. Meter placed on the shoulder (?) of the pin itself at the chip, example shown below). 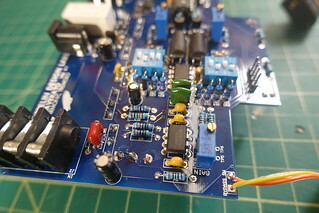 So I know each pot’s wiper is adjusting 0 to 5V smoothly and independently and the micro is seeing that voltage — measurement location rules out opens or shorts from pot all the way thru board, micro socket, to micro. 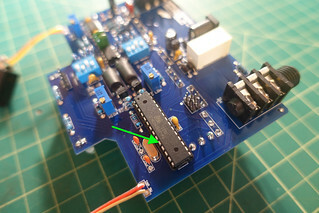 Is it possible there is an internal short or break in the analog input section of the ATmega chip itself? I keep going back to something wrong with the micro probably because it’s not something I can check myself. Will prob just order a new one anyways simply to rule it out for my own sanity. P2 pins checked, 5V on pin 2, GND on pin 6, pins 1,3,4,5, continuity back to corresponding pins on micro. 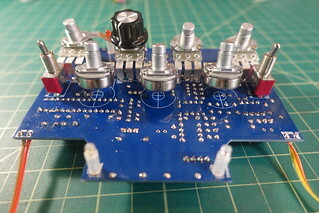 Phase switch works — at times when getting trem effect, can hear the difference between normal and harm trem. 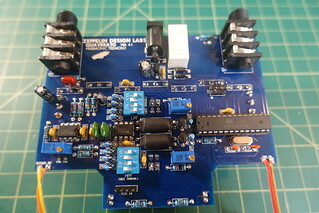 Mode switch works — momentary/latched modes check out. Footswitches open when not depressed, closed when depressed only. Y1 probably working since when the effect does work, the tempo is steady. C5/C6 verified correct values. Variable resistors & gain set per build manual.